With the following answers we have tried to anticipate most of your questions about our Thermoelectric Air Conditioners. If you have a suggestion or need additional information, please let us know. 1.) What is an air-to-air exchanger? An air-to-air exchanger is a device for the cooling of air in an electronics enclosure. ElectraCOOL™ AC units are delivered ready to be easily and quickly mounted. For cooling it uses electrical energy only. The same effects of a traditional compressor system can be obtained without the employment of gas or moving parts (except the fans). 2.) How does an air-to-air exchanger work? Air-to-air exchangers utilize the Peltier effect whereby the heat is transferred via the flow of current through thermoelectric modules. One part absorbs the heat and, as a consequence, reduces the temperature (cold-side) and the other part dissipates the heat to ambient (hot-side). 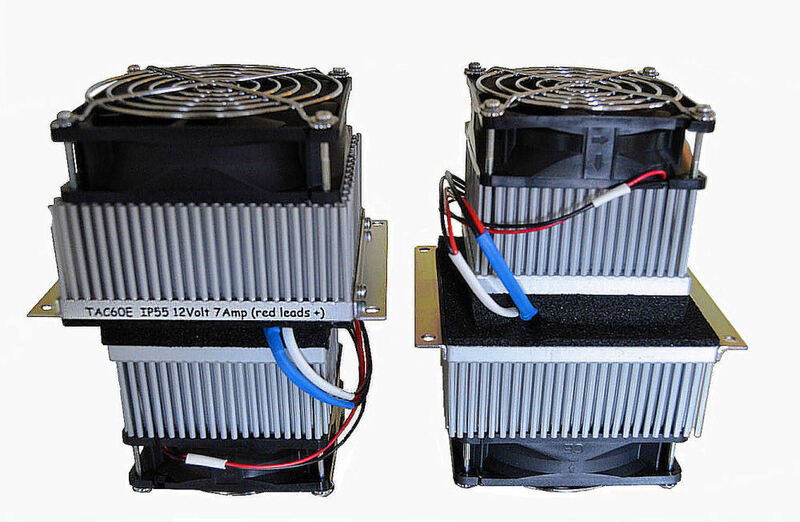 Fans are used to move air over heat sinks attached to both the hot and cold sides of the thermoelectric modules. 3.) What are the advantages over a compressor-based system? There are no moving mechanical parts (except fans) so thermoelectric air-to-air exchangers are extremely reliable with an almost unlimited life span and require no maintenance (except possible fan replacement). "Static" construction makes TE exchangers immune to vibration thus allowing them to be used in any orientation and makes them particularly suitable for the application on moving systems including ships, aircraft and robots and vehicles like ambulances (to keep medication compartments at temperature). A thermoelectric air-to-air exchanger does not contain any polluting substances such as CFC or other gases, has a more compact and simple structure than a compressor system and can be easily adapted and mounted. 4.) What are the major components of a thermoelectric air-to-air exchanger? The heart of the system is one or more thermoelectric modules. The cold-side of the module is connected to a heat sink with a fan (forced convection) that absorbs heat from within the enclosure and circulates the cooled air. The warm or "hot-side" of the module is connected to another forced convection heat sink that dissipates the heat, absorbed through the cold side as well as the input power to the module/s, to ambient. 5.) How much heat can be transferred with a thermoelectric air-to-air exchanger? 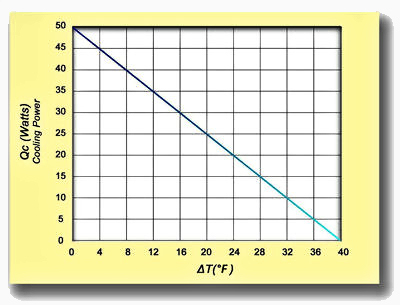 The cooling capacity or QCmax for our thermoelectric air conditioners describes the number of watts that can be removed from an enclosure without lowering the temperature below ambient (DT=0). This is also known as the nominal cooling capacity. In general, the QCmax value is of most interest for users who don't require cooling but rather simply don't want the air in the enclosure to increase in temperature above ambient. When cooling below ambient is desirable, the capacity in watts or Btu/hour decreases as the exchanger works to provide colder temperatures. See the performance curve for a particular unit to see how many watts can be extracted at a given temperature drop. Each ElectraCOOL™ AC unit is rated for a specific number of watts or BTU/h. To increase capacity beyond our largest 200 watt unit, additional units, can be wired in in parallel (same Voltage), or in series (typically, to a higher Voltage). Contact our technical support folks for assistance as necessary. 6.) Can a thermoelectric air-to-air exchanger reduce the temperature below that of the ambient? Yes, but keep in mind that the cooling capacity decreases as the difference in temperature between the air inside the enclosure and ambient increases. Unless a suitable insulation is provided, the enclosure we want to cool tends to absorb heat from the environment making cold internal temperatures difficult to achieve. 7.) How precisely can a thermoelectric air-to-air exchanger control the temperature? That depends on the type of control used and where the temperature is measured. Under ideal conditions, a tolerance of ± 0.1 °C is possible. 8.) Where is the heat absorbed by the thermoelectric air-to-air exchanger transferred? Since heat may not be destroyed, only moved or distributed, it is dissipated into the ambient air surrounding the unit. The "hot-side" of the unit will always be warmer than the ambient air temperature. 9.) Can a thermoelectric air-to-air exchanger be used for heating? When inverting or reversing the direction of the current flow crossing the thermoelectric elements in the exchanger, the process itself inverts and the heat is moved in the opposite direction. Temperature may also be controlled in the heating mode. For this reason, ElectraCOOL exchangers are excellent in outdoor applications where ambient temperatures vary above and below a desired temperature (range). With an appropriate "dual," or two set-point temperature controller (like the TLK38-S), you can program ElectraCOOL™ AC units to cool or to warm, as necessary to protect your electronics year-round. 10.) 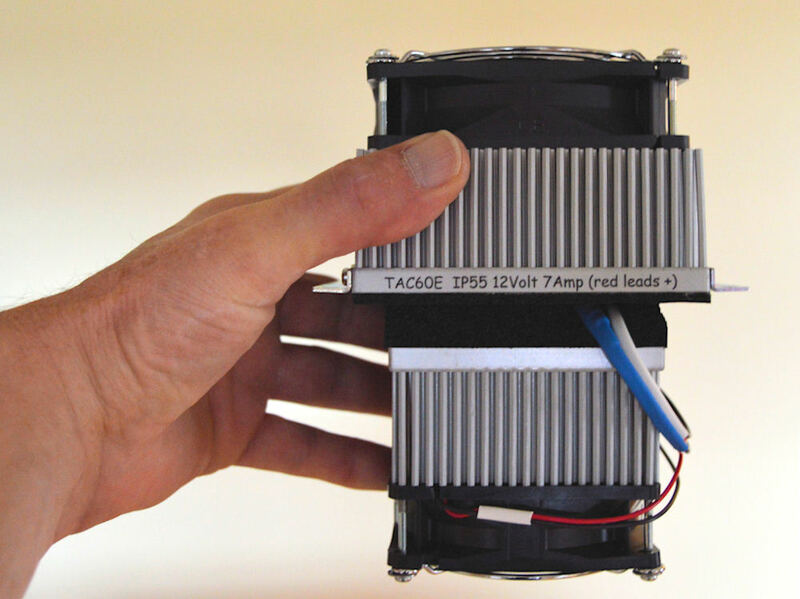 How do we handle a thermoelectric air-to-air exchanger? Each exchanger is a ready-to-be-integrated unit and can be quickly installed onto the respective enclosure or machine using only a few screws. Mount the ElectraCOOL™ AC Unit by passing the cold-side through a square opening in the enclosure wall with the larger "hot-side" coming to rest against the outside wall of the enclosure. The unit is then secured by fastening with bolts or screws. Some units have "L" brackets or flanges, mounted on the sides for mounting. Each attachment process compresses a neoprene gasket, located on the hot-side heatsink, against the enclosure wall, making a watertight seal. The left image shows a TAC60™ with Hot-Side up. On the right, the TAC60™ has been flipped upside-down and the Cold-Side is at the top. When mounted, the Hot-Side will be entirely outside of the enclosure while the cold side will be within. After the ElectraCOOL™ AC unit is firmly attached, simply connect to a suitable power supply, which may or may not be equipped with a temperature control function. 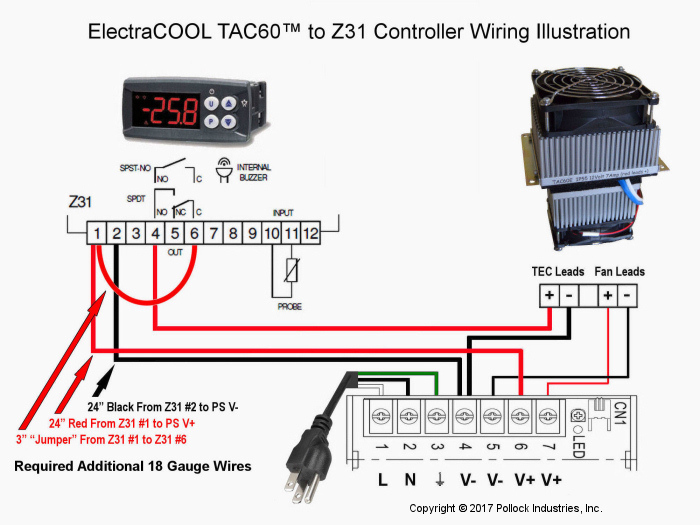 Some of our ElectraCOOL™ have leads while others have a terminal strip for connections. If you select a model with leads, they may be cut to shorter lengths to reduce clutter within an enclosure. 11.) Must the exchanger be installed in a certain position? Our exchangers may be mounted in any orientation, as long as the dissipation of heat is not impeded on the hot-side. The force of gravity does not represent an obstacle. For complete installation instructions see our ElectraCOOL™ TAC™ Mounting Considerations & Instructions page. 12.) What is the lifetime of a thermoelectric air-to-air exchanger? The cooling modules in an exchanger are solid-state with a MTBF over 200,000 hours. The only maintenance required may be the replacement of fans. 13.) Is a thermoelectric exchanger reliable? 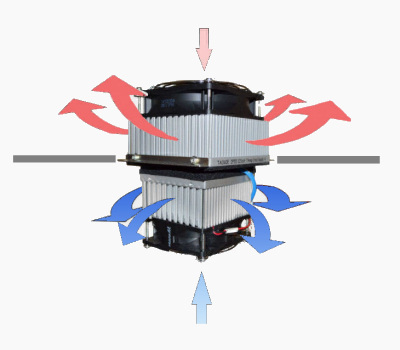 YES - In general operation, the only parts of the ElectraCOOL™ AC unit that needs service are the fans. We use very high quality fans but, fans do wear out and will need replacement every few years. 14.) How much space does a TE air-to-air exchanger occupy? ElectraCOOL™ AC units are compact and generally occupy less space than traditional compressor systems. From our compact TAC60™, occupying only 4x4x6.5 inches (100x100x155mm), to our largest TAC200™ unit measuring roughly 16x8x8 inches (400x181x201mm) they are great for a variety of enclosures and can often be door mounted. 15.) What are the protection ratings for exchangers? Our exchangers are "IP" protection rated according to rules IEC 529. Standard units are IP20 rated and designed for use in a clean, dry environment. Upgrading to an IP55 rating (protected against dust and against water jet with nozzle) is available at slightly higher prices. This rating is similar to a Nema-4X rating. 16.) What is the lead-time for delivery? Reasonable quantities are in stock. The standard lead-time for production quantities is 7-8 weeks, ARO. Call or email with your requirements. 17.) I need something different. Can you help? Thanks to the information made available to us by way of our questionnaire we can put together, without cost or obligation, a first assessment of whether and how you could employ a thermoelectric exchanger to solve your specific problem. Click here for our AC questionnaire. 18.) How much does a TE air-to-air exchanger cost? Like many state-of-the-art products, thermoelectric exchangers are not inexpensive but provide outstanding value. Our prices range from about $200 to $700. For most of our customers, the benefit of keeping critical electronics, or other components, cool enough to perform reliably far outweighs the cost of our components. Kindly call or e-mail Us with your requirements for a prompt quotation.